Have you heard of saging or smudging? Have you noticed those dried plants wrapped in string at a Farmer’s Market? Does your friend have one sitting on her coffee table or night stand? Have you ever received one as a gift? Or seen some in Anthropologie? While widely and readily available, I've noticed that few people have actually used Sage in their homes. I find that it centers me, dispels bad energy, and provides a calming presence that is invaluable when I walk through the door. So what is it? Saging or Smudging is a ritualistic way to cleanse a person, place or an object of negative energies or influences. The best time to Sage is anytime- and some believe you can never Sage too much. I have found bi-weekly and after a deep cleaning of my home is the best time to Sage. When I moved to LA five years ago I lived in the most adorable bungalow. As charming as it was, it was also incredibly old and had seen better days. I couldn’t help but think of how many people and pets had lived in this place before me and felt that it needed more than a good cleaning…there was a strange vibe, an intuitive feeling that I just couldn't shake. As I was furniture shopping that first weekend in LA at a Farmer’s Market I stopped by a booth that sold candles and these gorgeous dried herbs, bound with string called smudge sticks. The man at the booth explained what Saging was and how it could clear negative energy from spaces... I knew this is what I had been searching for and exactly what my home needed. I want you to think about your own intuition and experiences. I’m sure you’ve had moments where you felt uneasy or had a "bad" feeling about something. Or what about after meeting someone where you knew you were in the right place at the right time and have a friend for life…those feelings/gut reactions/intuitions are important to pay attention to. I've found that discovering, understanding, and following that feeling has always led me to the right place- even if it's a negative energy that I know I can clean out. 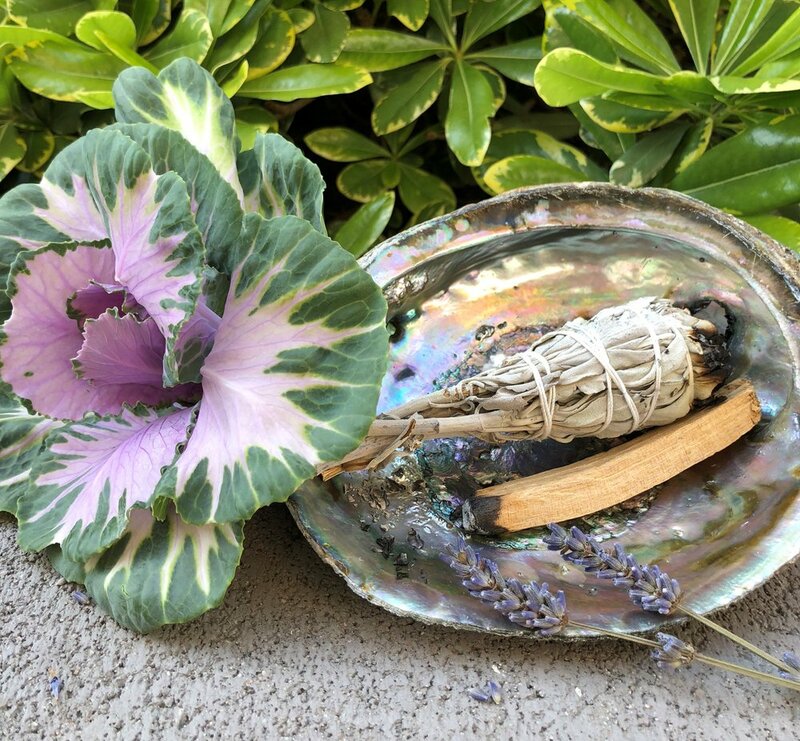 The ritual of burning sage and other herbs can help to clear any stale or stagnant energy that could be collecting in your living space, removing negative history and creating a neutral space for you to build your own environment. When Smudging open all the windows, all the doors to each room and the closets. Light the smudge stick, let it burn slightly, and then once it starts smoking walk it around your home. You want to wave the smoke into all corners of your home specially areas where there’s not a lot of action. The smoke will overpower that negative energy and dissipate into a blank energy canvas for you to paint over! Once you’re finished you can lightly tap the ash away in a flame free container. Or, a more traditional way to hold your Smudge Stick is in an Albacore Shell which represents something natural and from the ocean. Many people end with lighting a candle to establish a fresh vibe and re-center the room. You can now get all of your ritual items at ELSAMARIT! #aselfcaremoment is to keep your most sacred space cleansed and only full of good vibes!